Two fishermen,who went to the sea, have been missed from Feroke in Kozhikode as the after effect of Ockhi cyclonic storm. Bava (48),Shaji (49) are still reported missing for the last two days,said the boat owner Abdulla. The coastal police have begun search operation. The sea will continue in rough condition for the coming two days also.Meanwhile,district collector U.V.Jose and revenue department officials visited Kozhikode South ,Beypore, and Thoppayil beaches today. Alert warning mobile announcement team has deployed in the coastal area to keep people off from the shore and make coastal citizens aware of the situation. 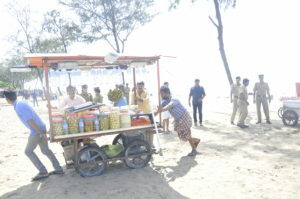 Beach vendors and their stalls have been taken away from the shore. Rough sea will be continuing for two more days in the state and fishermen are warned not to go to the sea. The cyclone is currently moving 500 kilometer away towards west side of the sea. Even the storm is weakened,the rough sea will continue for another two days. Around 110 Lakshadweep residents are staying at various lodges in Kozhikode as the boat service to the Lakshadweep cancelled due to the cyclonic storm. This News was posted on Saturday, December 2nd, 2017 at 11:50 am and is filed under City Talk.